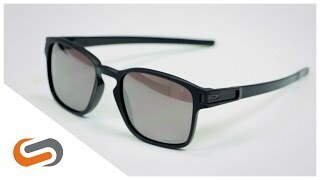 Oakley Latch Sq sunglasses take appearance and technical features up a notch with its classic keyhole bridge and interior kick-up feature that lets you clip the frames onto your shirt. These Oakley sunglasses offer a sharp look with its rectangular lenses, and the durability and all-day comfort you'd expect with its lightweight, stress-resistant O Matter frame material and Three-Point-Fit design. If you're looking for a pair of Rx sunglasses that won't compromise your style, the Oakley Latch Sq prescription sunglasses will be sure to fulfill those needs.